The basic idea of a quantum computer is to replace the ones and zeros used in today's bits with quantum states, or qubits. Qubits are units of information that not only assume the values zero and one, but in which zero and one are possible at the same time, and in any chosen combination, in the form of a quantum superposition. Qubits can, for example, be implemented using the spins of individual electrons held in nanoscale structures made of semiconducting material, known as quantum dots. By exploiting quantum-mechanical principles such as superposition, a quantum computer can achieve enormous processing speeds – but only if the electron spins persist for long enough. Physicists at the University of Basel and the Swiss Nanoscience Institute have now established that qubits' coherence is limited by a process in which individual electrons are exchanged between a quantum dot and an external reservoir. The reservoir represents a type of electrode that is in contact with the quantum dot and is required for the measurements. 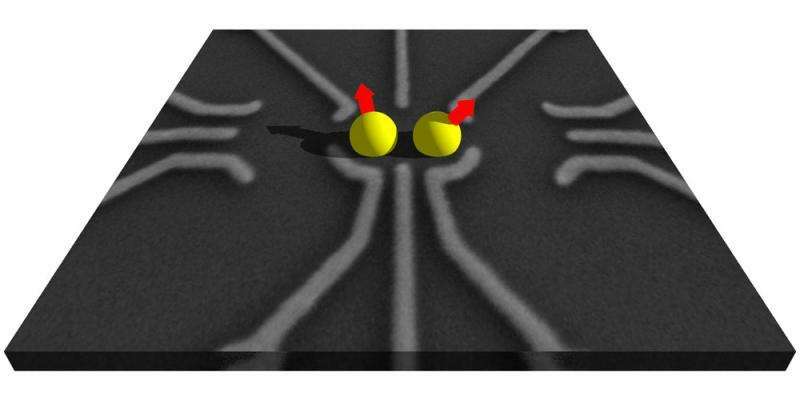 This approach, whereby quantum dots in semiconductors are exploited in order to use the spin of an individual electron as a qubit, can be traced back to Prof. Daniel Loss of the University of Basel and the American physicist David DiVincenzo. Their concept, which they originally presented in 1998, has the potential to allow the creation of quantum computers with a large number of connected spin qubits. The current study was carried out in collaboration with researchers from the University of St Andrews and the University of California, Santa Barbara.